Moments: "Love Takes the Cake"
She’s known for her delicious cakes, but there’s no recipe for dealing with the new man in her life. Charlotte owns the best bakery in Louisiana, and clients come from near and far for her renowned wedding cakes. And while the wedding scene is Charlotte’s place to shine, her own love life is more dull than ever. After a string of failed relationships—and men who actually were too good to be true—she has decided to throw herself into her craft and leave love and marriage to her clients. Will is a successful entrepreneur but devotes much of his spare time to caring for his ill mother. He knows he doesn't have much time left with her, so he has done everything he can to guard his heart from relationships. And what girl would understand that he needs to spend all his time with his mother? But when his best friend calls in his help for his September wedding, Will can’t refuse. He's always been there for those closest to him. And when he finds out they don’t have a wedding cake yet, he knows exactly where to go—the bakery owned by the beautiful, mysterious young woman he buys treats from. Charlotte assumes Will is just another party boy who flirts with all the bridesmaids. But is Will hiding something that explains his behavior? And despite their reservations, will they be able to deny the chemistry between them? I am a fan of Betsy's books as I enjoy her style of writing, her characters and storylines; this new novella is just as wonderful as her novels. Charlotte and Will are both loveable characters and ones that I immediately liked as they are easy to relate to as they are each dealing with things in their own lives that have not made their lives easy. Neither of them are actively seeking a relationship, but once they meet and their interactions with each other result in curiosity and chemistry. This is such a sweet story and I love the various relationships between the characters and how they are woven into the storyline. 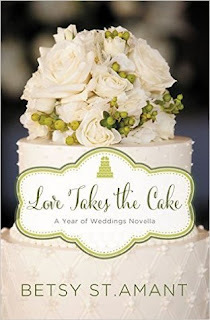 I love this novella collection as I love weddings, but I also love the focus of each one being on a different aspect of planning and having a wedding and that although they are novellas, I feel as if the story is complete. Book Review - "The Imposter"
Book Review - "Murder at the Courthouse"
Chinese Cooking - all you need!